The 1980s were dark years in Santiago. Opposition to the dictatorship was being reconstructed in clandestine fashion. 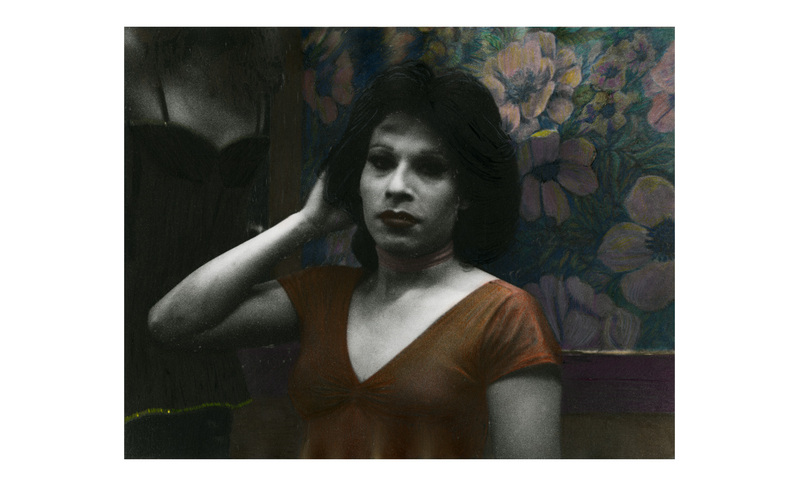 The nights in La Palmera, a neighborhood of transvestite bars frequented by the photographers Leonora Vicuña, Paz Errázuriz, and Marcelo Montecino, were more luminous than the grey days of political repression. Born in 1952 in Santiago, Chile. Lives in Santiago, Chile. In the early 1960s, Leonora Vicuña moved from her native Chile to France, where she lived for more than twenty years. She has a degree in anthropology from the Sorbonne and has carried out photographic projects in both France and Chile. Since 1979, she has applied pigments and colored pencil to her black-and-white photography. Her work of the 1980s captures daytime and nighttime scenes of everyday life: streets, figures, interiors, and bars in the cities where she has lived. She is one of the founders—along with Paz Errázuriz—of the Asociación de Fotógrafos Independientes de Chile. She worked as a montage designer on the animated film The Rainbow Thief by Alejandro Jodorowsky. She teaches photography and multimedia at several universities in Chile. Her work has recently been shown in several exhibitions, including Pulsions Urbaines at the Espace Van Gogh in Arles, as part of the international photography festival Les Rencontres d’Arles (2017), Urbes Mutantes at the Museo del Banco de la República in Bogotá (2013) and then at the International Center for Photography in New York (2014), and América Latina, 1960-2013 at the Fondation Cartier pour l’art contemporain in Paris (2013).